Would you communicate with the offender of your crime and tell them how their actions have affected you? 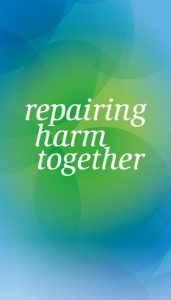 Restorative Justice is about victims and offenders communicating in a supported environment to discuss the harm that has been caused and how to find a way to repair that harm and providing a means of closure. For victims, meeting the person who has harmed them can be a huge step in moving forward, by giving them a voice and helping them to recover from the crime. For offenders, the experience can help them understand the harm caused and the impact of their behaviour and give them an opportunity to make amends. A Restorative Justice professional will talk to you about the impact and consequences of what happened, and what could be done to make things better for you. They will ask you if you would like to communicate with or meet the person who has committed the crime or anti-social behaviour. After this the person who has committed the crime or anti-social behaviour also has the chance to talk to the Restorative Justice professional. This involves talking about the harm caused and what could be done to make amends. They are also asked if they want to meet you. If both say yes, then you will be given the opportunity to talk about what happened in a meeting. The Restorative Justice professional will organise this for you. The meeting is called a Restorative Justice conference. It is voluntary and only takes place if everyone agrees to it. It is held at a neutral location at a time which is convenient to you and is led by the professional facilitator. You will be able to bring along relatives, friends or other people to give you support. Restorative justice gives you a chance to communicate directly or indirectly with the other person and discuss what happened. It can help you gain an understanding, describe your feelings and ask questions. Most importantly it can repair the harm caused. With restorative justice we provide an alternative way of dealing with an offence or incident, the process is focused on the needs of the individuals involved. You can also involve a friend, family member or professional support. Your restorative justice facilitators will be there to support and guide you throughout the process, they will help you feel safe, at ease and fully prepared. The facilitators take their lead from you and you can change your mind at any time. After this, you will be able to decide whether you want to meet or communicate with the other person. When can Restorative Justice be used? Restorative justice can be used in a variety of situations from anti-social behaviour to the most serious of crimes. It can be used at any stage of the criminal justice process. We at Lighthouse believe that every victim should be given the choice. Restorative Justice is always voluntary, there is no obligation to take part. Please get in touch if you would like to find out more or take part in Restorative Justice. We can then talk things over with you in confidence and answer any questions you might have. Please note that emails/phones are not monitored during evenings and weekends. In an emergency please call 999 and in a non-emergency call 101. A victim’s guide to Restorative Justice - a film for victims of crime explaining the different points in the criminal justice system where you can access restorative justice. It also tells you who you can contact if you want to make use of this approach. Watch Moving on, a short film by the Restorative Justice Council - a re-enacted portrayal of a real Restorative Justice Conference. For more films and stories of people who have experienced restorative justice, you can visit the Restorative Justice Council website, or join in the facebook and twitter conversations about restorative justice. On June 1, 2017, a new single restorative justice service covering the whole of Avon and Somerset went live, providing a single point of contact for restorative justice in the area. The service named “Restorative Approaches Avon and Somerset” or RAAS for short is being delivered by Bristol Mediation in partnership with Avon and Somerset Police and is an amalgamation of the existing Bristol Neighbourhood Justice Team (NJT) and North East Restorative Approaches (NERAP). Increase the availability for restorative workshops and pre and post sentence RJ. The service has been commissioned and appointed by the Office of the Police and Crime Commissioner and will run until from 1st June 2017 to 31st March 2019, across Avon and Somerset.